When you first created your Windows Live Hotmail account and profile, you typed your full name in one of the text fields that collected your information. This name you typed is now used as "display name" for your Hotmail account: in other words, this name appears as "From" sender whenever you send an email to someone. Whether you got married and need to update your name, or made a typo when setting up Hotmail initially, or for any other reason, Hotmail lets you edit and change the display name of your account. This tutorial explains how to do that. Click on the Options dropdown menu displayed in the top right corner of any of Hotmail's email screens: choose the last item, "More options" to get to the Hotmail Options screen. Under the first section of settings ("Manage your account"), locate and click on the View and edit your personal information link. Note that in many cases, Hotmail will ask you to re-enter your password: this is to protect you by preventing someone from modifying your profile information if you left your computer unattended while logged into Windows Live Hotmail (for example). Type your password to confirm your identity, and then click the Sign in button. Windows Live Hotmail will now load the Registered information screen, listing all the information attached to your profile, including display name. Under Name, the display name you picked when signing up is displayed. Click Change to modify it. Simply type a new First name and/or Last name in the appropriate field. Your Hotmail first name is visible to everyone, but your last name is not public by default. 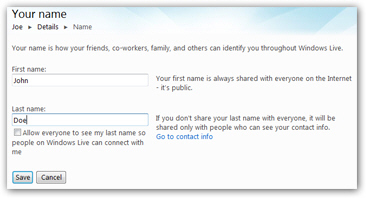 To make your last name visible to everyone outside your Hotmail contacts, check the "Allow everyone to see my last name so people on Windows Live can connect with me" checkbox. Once you are done, click the Save button: Windows Live Hotmail will now display the new name you picked, and bring you back to the Registered information screen; click the Mail link displayed at the top of the screen to go back to your emails and inbox. The next email you send will reflect your updated name information. Hotmail Tutorial The new Hotmail Hotmail.com Create a Hotmail account Hotmail sign in Hotmail sign out Read your Emails Read your emails Show images and content Download attachments Delete email messages Delete all emails from a person Unsubscribe from mailing lists Mark emails as Unread / Read Hotmail Instant Actions Unflag / Flag email messages Hotmail Quick Views Compose & Send Emails Hotmail email Reply to emails Forward emails Compose a new message Formatting emails Send attachments File attachment size limits Add pictures to your emails Create a signature Sending emails Send mail from other accounts Send plain text emails Change importance of emails Select multiple emails Spam & Junk Mail Filtering Mark spam email as junk mail Spam and junk mail settings Block email senders Unblock email senders Report phishing scam emails Standard Hotmail Folders The standard folders Hotmail Inbox Hotmail Junk folder Hotmail Drafts folder Hotmail Sent folder Hotmail Deleted folder Show or hide email folders Custom Hotmail Folders Create a new folder Rename a folder Empty a folder Delete a folder Mark an entire folder as "Read" Hotmail Contacts Hotmail Contacts Add a sender as contact Create a new contact Edit contacts' information Delete a contact Remove duplicate contacts Import contacts into Hotmail Export Hotmail contacts Contact categories Copy / transfer Hotmail contacts Add picture to contacts Block emails from non contacts Add Safe Senders to Hotmail Hotmail Tips and Tricks Hotmail Tips View email headers X-Originating-IP Show / hide basic headers View emails full screen Check for new emails Print email messages Hotmail Help Add another email account Check another email account Sort your emails Find emails with "Search Tool" Create email filters Automated vacation replies Use Hotmail as default email Hotmail account start date Configure Hotmail Settings Customize Hotmail Options Hotmail Login Hotmail accountCheck last Hotmail accessChange "From" name in emails Change password Reset your Hotmail password Change security question Forward emails to other account Skip "Hotmail Today" Change Reply-to email address Disable sent email confirmation Show conversations / threads Disable conversation grouping Disable photo / video previews Change Hotmail language Hotmail.com in English Hotmail.com en Español Change country setting Change birthday / birth date Keyboard Shortcuts Delete your Hotmail account Reading Pane Settings Change Theme Switch back to the old Hotmail Save / delete sent messages Change Hotmail address Change profile picture Change Hotmail account Other Products & Services Hotmail Messenger Hotmail Messenger Download Hotmail Plus Cancel Hotmail Plus Hotmail Customer Service Hotmail Live Hotmail Kids Set Hotmail as homepage in IE Hotmail as homepage in Firefox POP & Mail Server Settings POP3 settings IMAP Settings Incoming Mail Server Setup Hotmail on iPhone Hotmail Outlook settings You've reached the daily limit Outlook Connector Hotmail Gmail Hotmail Yahoo!